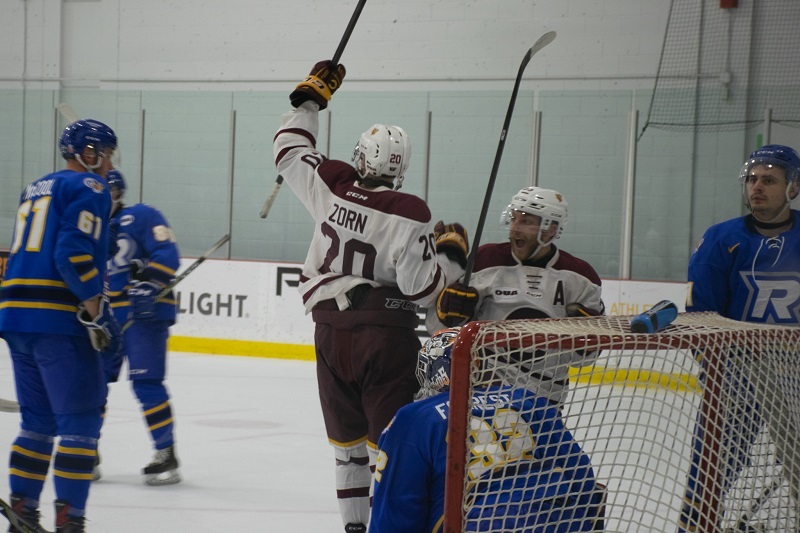 The Concordia Stingers men’s hockey team beat the Ryerson Rams 6-4 in a penalty-ridden game at the Ed Meagher arena on Oct. 20. Both the Stingers and the Rams went into the game coming off overtime wins the night before. The Stingers scored 10 goals in two games this season. Photo by Gabe Chevalier. Much like the night before, the Stingers came out firing quickly and most of the play was in the Rams’s end. The Rams took three penalties in a row, and rookie forward Chase Harwell scored on the second power play. Forward Hugo Roy added another goal on a five-on-three to open a 2-0 lead for the Stingers, but the Rams came back within one when Hayden McCool scored a minute later. By the end of the period, with a 2-1 Stingers lead, there were a total of 16 penalty minutes. The second period played exactly like the first, with six more minor penalties. Rams Matt Mistele and McCool added two more goals early on to momentarily take the lead. That was until forward Philippe Sanche and rookie Zachary Zorn scored two goals back-to-back midway through the period. Sanche’s goal was on the power play, while Zorn scored shorthanded. The Stingers handed the Rams their first lost of the season. Photo by Gabe Chevalier. The Stingers were up 4-3 after two periods, but Mathew Santos scored early in the third for the Rams to tie it. The Stingers took back that lead with five minutes left in the third, as Roy scored again on the power play. As desperation set in for the Rams, Harwell scored his second goal on an empty-netter to seal the win for the Stingers. By the end of the game, there were 19 minor penalties for 38 minutes, and only one goal was scored at even strength. With the Stingers win, they improve to 3-2-0 on the season and hand the Rams their first loss of the season. The Stingers kick off a four-game road trip on Oct. 26, with their first game against the Western Mustangs. Main photo by Gabe Chevalier.